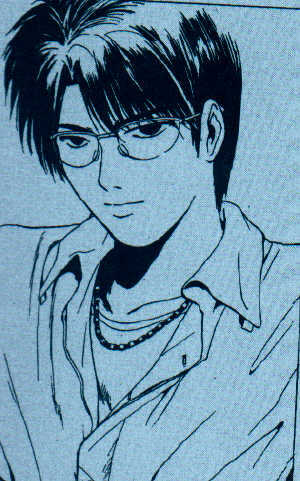 Yoshito Kikuchi Manga Gallery-Part of the Great Teacher Onizuka Fansite Holy Forest Academy. More pictures will be added in due time. Can't exactly put everything up at once. I need something to draw the crowds back here! Section first created on: February 16, 2003. This particular section was last updated on: April 21, 2004. The max # pics I'll throw in a 'set' is 10. C 5-up on 3/2/03, 1-up on 10/29/03. BACK TO THE COMPUTER LAB!!! 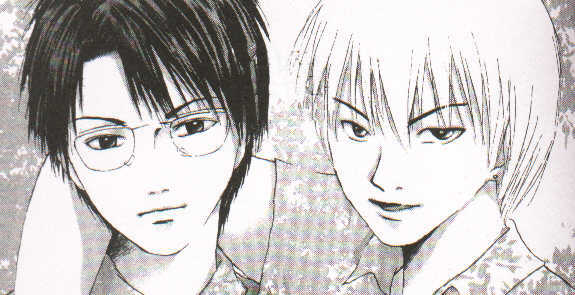 A1) If you needed another reason as to why not to mess with these two... A2) Kikuchi's turn to be the magic genie... and Onizuka's non pleased. A7) Doing the Kanzaki pencil twirl is not that easy. A8) He's up to SOMETHING... and it's not going to be pretty. A9) Adjusting his glasses. A10) Very sure, very confidient, very calm. A3) Despite being smart, he doesn't like tests... A4) If you know a good thing, stuck with it. A9) Something you DON'T want to WAKE UP to... A10) It's nice to be appreciated... I think. C1) You should have someone take a look at that... C2) There is NO doubt that these two make a good team. C3) A lovely teacher to student moment... C4) Feeling of surprise! The blue coloring was a little something I did to it.